Could the Cowboys go wide receiver with their first pick in the 2019 NFL Draft? Could the Cowboys use both their first-round and second-round pick in the 2019 NFL Draft on wide receivers? They most certainly could. Back in October, the Cowboys sort of drafted Amari Cooper with the 27th overall pick, by sending their first-round pick to the Oakland Raiders for his services. With the 58th overall pick, could the Cowboys turn back to the receiver position to bolster their receiving corps heading into 2019? With Cole Beasley set to hit free agency, and no true slot wide receiver on the roster, here are three receivers the Cowboys could target with the 58th overall that could fill out their starting lineup. Out goes Cole, in comes Deebo. 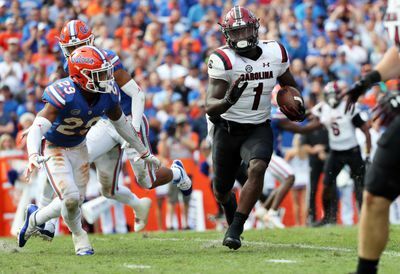 The former South Carolina wide receiver is entering the draft as one of the more talented wideouts, but this receiving class will probably fall more toward the second round which could allow Deebo Samuel to slip to the Cowboys at the end of the second round. Entering the 2019 NFL Draft, Samuel reminds me a lot of what we saw in DJ Moore last year, who was drafted in the first round by the Carolina Panthers. Samuel doesn’t have Moore’s athletic ability, but every other aspect of his game is almost an identical clone of DJ Moore. In his four years at South Carolina, Samuel struggled to stay healthy, but when he was, he was lighting up the SEC. In his senior year at South Carolina, Samuel silenced all doubters catching 62 footballs, for 882 yards, and 11 touchdowns. Samuel is a very crisp route runner who possesses great upper and lower body nuances that allows him to create easy separation. Deebo is one of the cleanest receivers in this class releasing off the line of scrimmage due to his ability to stack DB’s and sell different route directions and leaving defensive backs guessing. Samuel is good in contested catch situations, catches the ball well outside of his frame, is dynamic with the football in his hands, and has some return value as well on special teams. If Deebo Samuel falls to the 58th overall pick, the Cowboys would need to think long and hard about turning in the slot receivers card. Another candidate to replace Cole Beasley is Andy Isabella. He possesses similar size to Beasley but Isabella is a superior athlete, though the two win in a lot of the same ways. In his four years at UMass, Isabella had 201 receptions, 3,526 receiving yards, and 30 touchdowns for the Minutemen. Isabella is extremely quick off the line in his releases, and crisp at the top of his routes to create easy separation in all three levels of the field. Isabella has impressive long speed and short area quickness which allows him to win both down the field and in the short-intermediate portion of the field. He is also a very nuanced route-runner that has done a nice job of using his short area quickness to get open in-and-out of his breaks. Like Samuel, Isabella is dynamic with the football in his hands, and also has some special teams value as a return man in both the kick and punt return game. While his size will likely force Andy Isabella to be a full-time slot, he showed enough at UMass that makes me think he could find success on the outside testing vertically as well due to his speed. Isabella does need to develop as a natural hand catcher, as he’s struggled catching the football away from his frame both at UMass and in Mobile at the Senior Bowl. A.J. 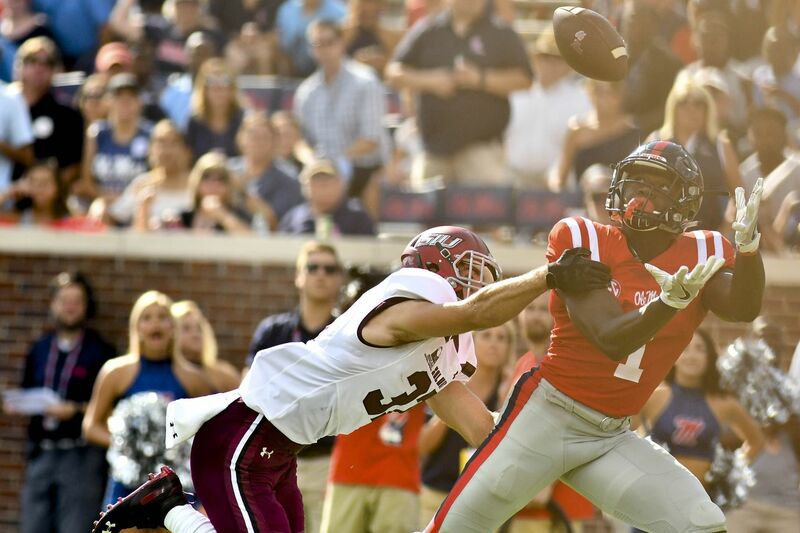 Brown is not the average slot receiver, but that’s where he primarily played at Ole Miss. Listed at 6’1” and 230-lbs, Brown is a big guy that is a much better route-runner than given credit for. 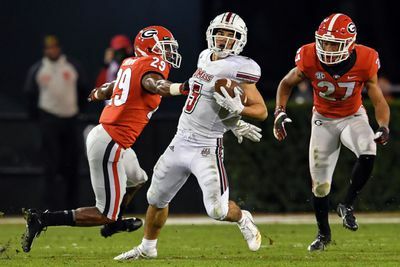 What Brown lacks in the athletic department, he makes up for with his reliable hands, route-running ability, and ball skills at the catch point. Brown’s home at the next level will likely come in the slot due to his lack of athletic ability, long speed, and short area burst when lined up on the outside. When lined up in the slot, Brown saw a lot of free releases and is able to use his route-running ability, and size to beat nickel defenders with ease. While Brown is certainly lacking in the speed department, he did show the ability to win vertically at Ole Miss. In his three years at Ole Miss, Brown hauled in 189 football, 2,984 receiving yards, and 19 touchdowns. Similar to Deebo Samuel, the Cowboys would likely need some luck to fall their way in order to land A.J. 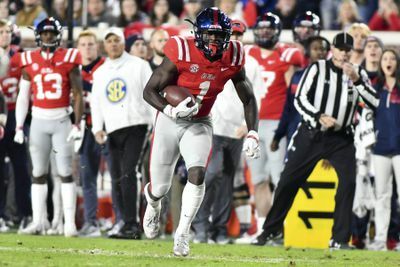 Brown, but with the lack of wide receiver talent at the top of the draft, and depending how he tests at the combine, the former Ole Miss wideout could certainly be there when the Cowboys are on the clock in the second round. Next week we will take a look at three tight ends the Cowboys could target with the 58th overall pick, and will continue on to safety position the week after. Be sure to check back in as we go through these three position groups for the Cowboys to target with the 58th overall pick in the second round of the 2019 NFL Draft.